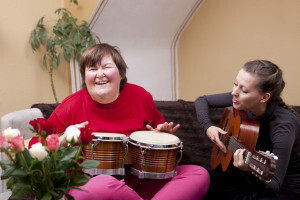 Because of music’s unique ability to access and stimulate numerous areas of the brain simultaneously, it can be used to encourage cognitive and physical function, provide motivation, and/or enhance the learning environment for those with developmental disorders and disabilities. A board-certified music therapist (MT-BC) will design the appropriate program using “client-preferred music” for your needs. Whipple, J. (2004). Music in Intervention for Children and Adolescents with Autism: A Meta-Analysis. Journal of Music Therapy, 41 (2), 90–106.